Founded in 1762 and later incorporated in 1831, Hagerstown, Maryland is located in the Appalachian Valley, seventy miles northwest of Washington D.C. Known as ‘Hub City’, Hagerstown experienced incredible growth in the nineteenth century as railroads ran their lines through the burgeoning community. The area continues to grow today, with more than 40,000 residents inhabiting 12.71 square miles. Hagerstown boast a plethora of restaurants and retailers, including two shopping malls. Conveniences such as grocery stores, pharmacies, banks and salons can be found throughout the city. There are two cinemas, three bowling alleys and three skating rinks for entertainment of all ages. Situated in an incredibly storied part of the country, dozens of historical landmarks and museums can be found in and around the greater municipal area. The City of Hagerstown maintains a whopping twenty parks, featuring playgrounds, walking trails, athletic fields & courts, stages, pavilions and dog runs. 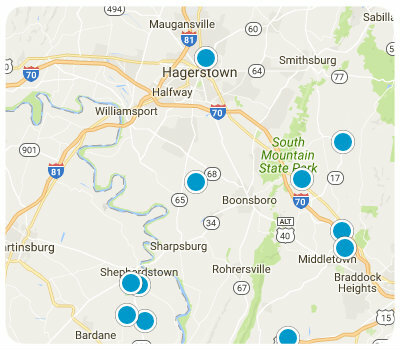 The Hagerstown real estate market contains quite the variety of properties to choose from. With homes at every price point, homebuyers can select from architectural styles such as Ranch, Split Level, A-Frame, Colonial, Traditional, Modern and more. As a city with a deep history, there is a great number of pre-World War II homes, complete with nostalgic charm. With the heightened development in recent years, more and more new homes are being built, many of them with luxury amenities. A considerable amount of these affluent subdivisions are situated in the northern portion of town. Whether in search of starter home, upgrading or downsizing, Hagerstown is a must consider. If you would like more information regarding homes for sale in Hagerstown, Maryland, please do not hesitate to contact us today.